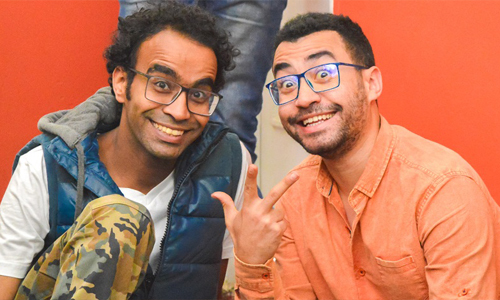 For many in Egypt, Friday is a day to do exactly nothing, but snooze till the afternoon – but not for Saturday Night Live Bil Arabi cast, who spend almost all of their Fridays running through the sketches for Saturday’s show in the newly renovated Studio Masr. 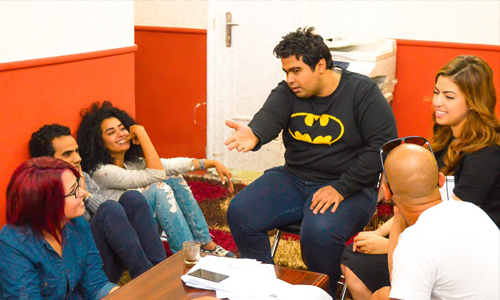 Catching them during rehearsals, the SNL Bil Arabi cast were putting some final touches on several sketches with the show’s directors and writers, as well as the week’s host, actress Ayten Amer, and music guests, Eftekasat. In what seemed like a cosy and jovial environment – with producers more than happy to invite us to watch the rehersals, as well as bringing us chocolate – we sat down with the entire cast during a short break. As a live to tape show, SNL’s basic premise is built on comedy sketches inspired by social issues and current events, which, in Egypt, are aplenty and more often than not, make for great material, according to the cast. “We gather at the beginning of the week to come up with comedy sketches for every episode. Some of these sketches are specifically written for the hosts; so they do have a say in the ones involving them, ‘Shadi Alfons, one of SNL stars, told us. The devil, however, is in the fine-tuning process that every sketch has to go through. With long working hours and sometimes having to stay overnight in the studio, both the writers and the cast settle on the final selected scenes to rehearse before the sketches are performed live on stage. Even when actors have rehearsed their roles separately and everything is settled for the on-stage rehearsals, sketches may be subject to a complete transformation. According to Hazem Ehab, he went home to rehearse a sketch only to find out the next day that it had been entirely changed. When asked if this process is frustrating for them or not, the cast said that it is an extremely rewarding process. “To us, rehearsals are like a product’s testing phase before hitting the market. 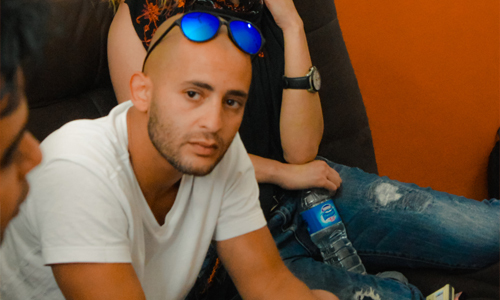 Rehearsals help us figure out the weak points in the script and improve it to create an even better sketch,” former Al Bernameg, Khalid Mansour, explained. Rehearsals take place over three days, with a final dress rehearsal taking place on Saturday – the day of the show. While SNL has arrived into a culture that has always been big on comedy, there’s no doubting that it’s the first show of its kind in Egypt and the Middle East. Many have drawn parallels with Bassem Youssef’s El Bernameg in terms of having a similar spirit in humour, but SNL’s appeal has been the fact that it tackles lighter issues – dating, marriage, and even football. But that doesn’t mean that the show hasn’t been met with controversy; SNL Bil Arabi’s version of The Assumption Song, The Zizo Song, was the show’s first hit sketch. Although it went viral, it received mixed responses, with many dismissing it as being crass. Speaking on how much feedback effects the script or the writing process, Islam Ibrahim, one of SNL’s actors, said that when it comes to comedy, each has his own taste. But having aired its first episode on February 20th of this year, the show was almost instantly received with great reviews. “The instant feedback we received from the internet showed us that people love the show or, at the very least, when they share our sketches on social media, it shows us they like them,” Alfons said. Though the whole process of putting together an episode can be exhausting, the cast all are unanimous in their response to their favourite part of it – performing in front of a live audience. “We could be at only 60% energy going into a show, but when faced with an excited audience, laughs and applause, it gives us a huge boost,’ explained cast member, Hazem Ehab. Asked if they believe that Saturday Night Live Bil Arabi can achieve the same longevity as its original, American counterpart, the cast seem happy to take it one show at a time. “Our only aim is to make people laugh and forget all about life’s troubles. If we manage to do that with just one sketch out of the eight we perform, then we’ve fulfilled our mission,” Islam Ibrahim concluded.